As you all know, Butterbee Farm has a CSA. A few different CSAs, actually. We like CSAs because we get some much needed money from our members before the season even starts, so we can still pay our rent even though we've bought tons of seeds and potting soil and flower clippers. It works like this: you sign up for our CSA by sending us a check (or paying online), and then we owe you flowers. Some farmers hate the CSA concept because they don't like being in debt. I completely understand that sentiment. What if a tornado comes and the whole farm is obliterated in an instant, and we can't pay our CSA members their flowers? Ugh. Rather than desperately thinking of rainbows and puppies, I can instead relax because our CSA members sign an agreement that basically says if the farm is wiped out by a tornado, they'll be nice to us and we'll do our best to pay them back. It is highly unlikely (knock wood) that such an event would occur, so I feel pretty good about being in debt. -Where to have the pick up? We decided on Parts & Labor and Red Emma's because we really love both establishments, and because they were into it. -How many stems of flowers and quantities of veggies will be in each share every week? That was tough, but we decided to offer a half share of veggies and a full share so that people could have options. We figured a nicely sized bouquet is about 15 stems, so that's what the flower portion will be for both shares. -How much will it cost? This is really hard for us because in a perfect world, we'd give our stuff away for free. 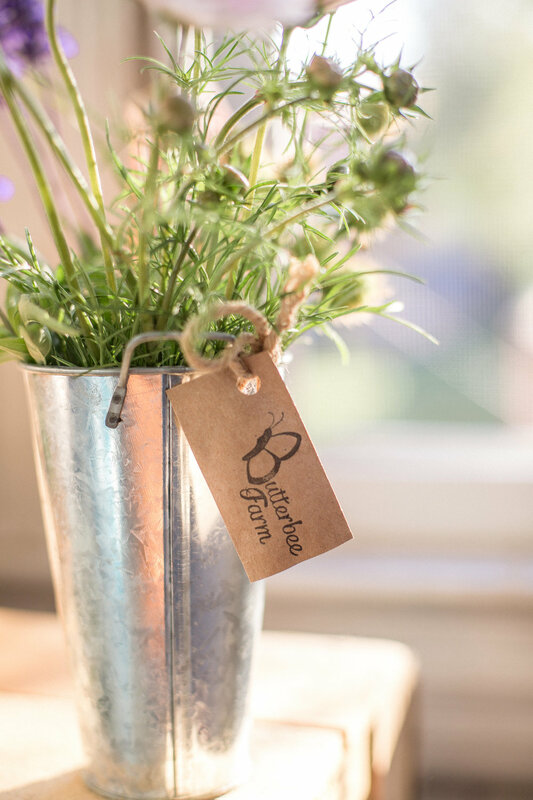 Little Gunpowder Farm already donates thousands of pounds of food to the food bank, and we donate flowers to non profit events when we can. But, in the spirit of small business, charge our customers we must! We decided that a half share, flowers included, would be $22/week, and a full share would be $32/week. -Who will organize the CSA? That would be me! Butterbee Farm is taking on most of the administrative tasks, and Little Gunpowder is doing volunteer events at their farm for our CSA members. Amazingly, the whole process of setting up the joint CSA has been really fun. Christy and Connor, the farmers/owners of Little Gunpowder Farm, have been my friends for a few years now. The CSA collaboration gives us the excuse to share the stresses/joys of farmer-hood. And an excuse for more potlucks. Now you know the inner workings of a CSA! I wish you a snowy sunset.